Let’s face it! Things happen. No one likes to pay for something they’re not going to use. We get it. We really do. However, we’re trying to employ great staff to love and care for your animals and sometimes this means you have to pay for a last minute cancellation. In order to provide the absolute best care to our clients, keep our team members happy & productive, and ensure our office is operating as efficiently as possible, we have implemented a Trusty Tails Pet Care Cancellation Policy on all appointments. Here we explain why. What Is The Trusty Tails Pet Care Cancellation Policy? Our Cancellation Policy can be viewed upon registration, in your online account, as well as in our Frequently Asked Questions section of our website. Our team members very much rely on the income from your schedule appointments. If a client cancels last minute on a staff, it is very unlikely that we, the office, will be able to find another appointment to fill in the slot on their schedule that you no longer need. This means our staff won’t get paid. By guaranteeing staff regular appointments and a steady income we are able to attract the best pet care professionals to work for Trusty Tails. 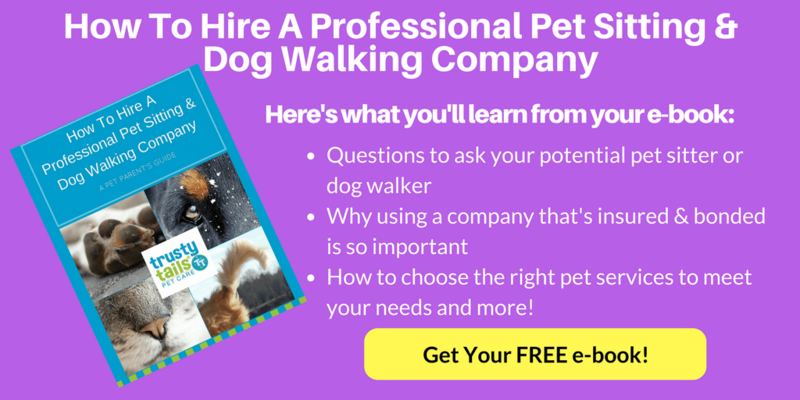 We do not settle for unprofessional or inexperienced dog walkers and cat sitters. We believe our clients deserve the best! By having cancellation policy, the office is able to focus on handling your calls and emails to the best of our ability. This policy further reduces the volume of time spent concerning late cancellations and allows us to better serve you because when you follow our cancellation policy, you are able to cancel online in the system on your own very easily and it automatically informs our staff once approved. Last minute cancellations mean the office has to take time to reorganize your schedule and notify the staff. We believe this policy acts is in the best interests of clients, furry and human, as well as our Trusty Tails team members! As always, thank you for choosing Trusty Tails! Have Questions About Our Cancellation Policy? Have Other Questions Regarding Your Pet Care Needs? Call Us at 201.446.1559 or Contact Us through our website.